He [Eichmann] began by stating emphatically that he was a Gottglaubiger, to express in common Nazi fashion that he was no Christian and did not believe in life after death. He then proceeded: “After a short while, gentlemen, we shall all meet again. Such is the fate of all men. Long live Germany, long live Argentina; long live Austria. I shall not forget them.” In the face of death, he had found the cliché used in funeral oratory. Under the gallows, his memory played him the last trick; he was “elated” and he forgot that this was his own funeral. It was as though in those last minutes he was summing up the lesson that this long course in human wickedness had taught us—the lesson of the fearsome, word-thought-defying banality of evil. David Halberstam in The Fifties (1993), explores why the chickens have come home to roost or human blowback (children running North) due covert CIA actions in Latin America. Halberstam writes that when Kim Roosevelt sensed the problem crated by his success in overthrowing of Iran’s first democracy in 1953 the moment he returned home in triumph. John Foster Dulles’ enthusiasm made Roosevelt so uneasy that he ended the briefing on a cautionary note: The endeavor had gone so smoothly, he pointed out, because local conditions were favorable—the Shah’s historical legitimacy had proved far more compelling than Mossadegh’s popularity, which was shaky at best. But Roosevelt sensed that Dulles was not terribly interested in that part of his report. In fact, even as Roosevelt was briefing the top national security people about Iran, planning was going ahead on the next coup—one that they hoped would topple the leftist government of Jacobo Arbenz in Guatemala. The success of the coup in Iran, Roosevelt sensed, had provided an irresistible inducement for the Eisenhower administration: It had been quick, painless, and inexpensive. A potential adversary had been taken out with almost ridiculous ease. American newspapers had all carried the cover story, although the press elsewhere and the Iranian people talked openly about the CIA role. The Guatemala plan, Roosevelt found, was already well advanced. He checked around a bit on his own and decided that the conditions for success in Guatemala were not so favorable in Iran. He turned down the offer eventually resigned from the CIA—just before the Bay of Pigs disaster, which, he liked to say, was compelling proof that his earlier warnings had been justified. What was happening at this moment, as against Arbenz gradually took shape, was that American foreign policy was changing. It was doing so very quietly with very little debate taking place—in fact almost no public debate, for that was seen as something that aided the enemy. President Eisenhower and many of his men around him, like those who had served Truman earlier, believed they were operating in a period that was, in any true sense, a continuation of the wartime period, when America had struggled against totalitarian governments in both Germany and Japan; now, they believed, the same struggle continued against Soviet expansionism. Because the enemy was cruel and totalitarian, we were justified in responding in kind. Our survival demanded it. There were no restraints on the other side; therefore there should be no restraints on us. The men who were the driving forces of this new philosophy, the Dulles brothers, Beetle Smith, and their various deputies, as well as the President himself, were from a generation profoundly affected by the vulnerability of an isolationist America to attack by foreign powers—as Pearl Harbor had proved. They worried endlessly that the very nature of a democracy, the need for the consent of the governed, made this nation vulnerable to a totalitarian adversary. Therefore, in order to combat the enemy, the leaders of the democracies would have to sacrifice some of their nation’s freedom and emulate their adversary. The national security apparatus in Washington was, in effect, created so America could compete with the Communist world and do so without the unwanted clumsy scrutiny of the Congress and the press. Given the nature of the Cold War and domestic political anxieties, the national security apparatus gradually grew richer and more powerful, operating under a separate set of laws (on occasion, it would become clear, under no laws at all). In any crisis, if there was an element of doubt about legality, it was best to press ahead because that was what the other side would do. The laws for the secret regime were being set by our sworn adversaries, who, we were sure, followed no laws at all. Guatemala, after Iran, was the next CIA target. It was [and still is] a small, very poor Central American country that the administration’s top officials, including the President himself, had already decided had gone Communist. Tensions between the United States and Guatemala had been on the rise since the late forties, when a harsh and brutal dictatorship under Jorge Ubico Castaneda had been overthrown and the Guatemalan government had begun to experiment with democracy. And inevitable byproduct of the Guatemalan social revolution was a new sense of nationalism, whose economic component was aimed at the United Fruit Company. Some called United Fruit La Frutera, others called it el lulpo—the octopus. In a country that was poor and weak, United Fruit was rich and strong—the largest employer in the entire country. Allen Dulles was enthusiastic from the start about a coup against the troublesome Arbenz. Both Dulles brothers, and Beetle smith as well, had close ties to United Fruit, and the top United Fruit lobbyist Tommy (“Tommy the Cork”) Corcoran, was a prominent New Dealer and Washington insider. From the start, Eisenhower was on board for a CIA-sponsored coup in Guatemala. More and more he saw Communism as a monolithic force that had to be combatted with extralegal means. This hard-line side of Ike was rarely revealed to the public. Privately and in small groups he seemed to subscribe to the prevailing simplistic view of the world as either part of the Communist or part of the free world. He also believed that Guatemala had moved too far left and represented a potential bridgehead for Communism in the continent. Eisenhower sent his brother Milton, both Dulles brothers and beetle Smith to the region where they all concurred that Guatemala had irredeemably broken with the policy of the United States. The proof of it, clearly, was in Arbenz’s land reform decree that allowed for expropriation of United Fruit property. The Washington government consistently hardened its line and came to the conclusion that Arbenz was beyond saving and had to go, that his government was in the hands of Communist. Guatemala was one of the poorest places in the Western Hemisphere. A small oligarchy owned most of the land, wages were desperately low (in recent months there had been strikes by workers on United Fruit’s banana plantations seeking wages of $1.50 a day), and United Fruit, with the help of bribes and payoffs, controlled the political process of the country. It also controlled, either directly or indirectly, as Stephen Schlesinger and Stephen Kinzer not in their book Bitter Fruit, some 40,000 jobs in Guatemala, and its investment there was valued at $60 million. Almost all of Guatemala’s railroad tracks belonged to a subsidiary of United Fruit; and in addition, United Fruit owned the telephone and telegraph facilities and ran the most important Atlantic port. Virtually anything that was modern belonged to La Frutera; what was old and broken-down belonged to the nation. That a coup was coming was by now an open secret in Guatemala. Mercenaries at the two CIA training camps were so well paid—about three hundred dollars a month, or ten times the going wage for United Fruit workers—that they had boasted rather openly and told of their plan to invade the capital and the revolution was to begin at 5:pm. There was one crucial ingredient left for the success of the coup and that was the cooperation, voluntary and involuntary, of the American press. This meant it was necessary for the press corps to tell the public that the coup was the work of an indigenous Guatemalan force. In general, given the tensions of the Cold War, the obvious sins of Eastern European Communism, and the fear of being accused of being soft on Communism, most editors and reporters tended to accept Washington’s side in any dispute involving Communism. United Fruit had already achieved considerable success in putting out its side of events, thanks principally to the skills of Edward Bernays, a pioneer in public relations who was well connected in the world of print media. He convinced United Fruit to sponsor a series of press junkets for selected reporters to Guatemala: These emphasized the benign aspect of the fruit company and the sinister purpose of the Arbenz government. An undated photograph of Arthur Ochs Sulzberger, publisher of The New York Times, at front center, with, from left, Walter E. Mattson, The Times' chief operating officer, Sydney Gruson, assistant to Sulzberger, and James C. Goodale, the newspaper's general counsel. In 1954, all the American press was bamboozled except for a talented New York Times reporter Sydney Gruson. However, unknown to Gruson, Allen Dulles of the CIA was wary of his reporting and a series of cables from Peurifoy had made his even warier. The CIA coup began on June 18 and was acted out by a ragtag army that seemed ill prepared to conquer. However against the forces of any developed country, the invading forces would have quickly collapsed. But Guatemala’s institutions were so weak that Arbenz was largely paralyzed and could not even get his (equally puny) air force into the air. Nevertheless, three days into the coup it appeared likely to collapse. The CIA people on location had to demand more planes—without which they would surely fall. The key to the victory was the CIA’s radio station, based outside the country. The Agency had jammed the government station and deftly created a fictional war over the airwaves, one in which the government troops faltered and refused to fight and in which the liberation troops were relentlessly moving toward Guatemala City. Dulles later asked C. D. Jackson, the administration’s psychological warfare expert, to arrange for some writer to do a major historical novel based on events in Guatemala, along the lines “of Uncle Tom’s Cabin or Ida Tarbell.” He would, he said, make everything available to such a writer, except, of course, the CIA’s role in the affair. A year after the coup, Foster Dulles asked Park Armstrong, the assistant secretary of state, whether his shop had ever found anything connecting Arbenz with Moscow. There was nothing conclusive, Armstrong had answered. In New York, Arthur Hays Sulzberger was not happy about the way his paper had been sidelined away from a legitimate story. He wrote Allen Dulles that he had kept Gruson out of Guatemala, “because of my respect for your judgment and Foster’s.” Therefore he felt it was very important to settle the issues of Sydney Gruson’s loyalty and his reputation. Dulles weaseled. He did not like the idea, he wrote Sulzberger, that “a man having his (Gruson’s) particular nationality, background, and connections should be representing you at a particular place and a particular juncture.” Beyond that, he had nothing more to offer. Sulzberger realized he had been used, [and the press had been coopted]. The Dulles brothers went from Latin American country after country treating each like Guatemala. The results their Communist witch-hunt and regime changes are evident in the grinding poverty and lawlessness that drives parents to send their children North. Stephen Kinzer in The Brothers takes up Halberstam’s narrative as a twice told tale that few Americans care to know or heed. Thousands of young immigrants, many of them from Central America, have crossed illegally into the United States this year, causing an unprecedented humanitarian crisis on the U.S.-Mexico border. The complaints center on what happens inside the group holding cells that immigrants call las hieleras — the freezers. The concrete cells are used by the Border Patrol to house adult and underage immigrants for days or weeks while they're being processed into U.S. immigration courts. The children are later sent to better-equipped government-run shelters. "I suffered a lot in la hielera," says 11-year-old Sixta, who is brought to tears by the memory. "I still wake up crying thinking I'm there. And I never want to return there again as long as I live." Her last name has been omitted because she is here illegally. Sixta crossed the Rio Grande with her older sister early last month after making the trip from San Pedro Sula, Honduras — the world's most violent city. She's now living with her mother in a ramshackle house outside of Dallas. Their living room is still full of balloons from her welcome party. Sixta was asked what was worse: the treacherous journey through Mexico, or her 17 days inside two Border Patrol stations in South Texas. "The experience inside the freezer," she says without hesitation. Sixta says the room was kept so frigid she caught a cold, and it went untreated for so long that she started bleeding from her nose and throat. When she asked for a doctor, she says, agents slammed the steel door to the cell in anger. Most Border Patrol stations have paramedics who are supposed to provide medical care. Sixta says agents told her and her sister, "You damned Hondurans are a pest in our country." Her first cousin is Jennifer, a slender, bashful 14-year-old who crossed into Texas separately a few weeks earlier. She's now living with her father, a television repairman, in Los Angeles. "It was horrible because they put handcuffs on my wrists and ankles when they put us on an airplane," she says, sitting in her father's tiny living room surrounded by broken TVs. "When we asked, 'Why are you putting these on?' they called us thieves and said, 'You came here to steal from our country.' "
Jennifer shows a scab just above her heel from where she says the restraints broke the skin. Immigrant children interviewed by NPR related other types of grievances, as well. A Salvadoran girl said they were refused water and had to drink from a toilet tank. Several kids said agents came in at all hours of the night to pound the walls with their batons to wake them up to do a count. Many of these complaints were included in a 25-page protest letter submitted last month to the Department of Homeland Security by five immigrant advocate groups. They take on new urgency now that the Border Patrol in Texas has been overwhelmed by nearly 60,000 unaccompanied Central American youths since October. The commissioner of customs, Gil Kerlikowske, said in an interview with NPR last week that his office takes charges of abuse seriously. He did not deny the immigrant children have legitimate complaints about conditions in the holding cells, but he discounted the most serious criticism. "When I looked at all of the complaints, sleeping on a concrete floor is not anything any of us wanted to see, and to see a room the size of this office with maybe 40 or 50 kids lying on the floor covered in a blanket, waiting two and three and four days to be actually moved to a better facility, I know that we were overwhelmed," he said. Reacting to the commissioner's comment, immigration attorney Erika Pinheiro says the problem is not new. "I'm sorry, but the commissioner absolutely cannot attribute this to the surge," she says. "This is something that's gone on for many years. At a minimum, we can expect CBP to respect the basic human dignity of these children." Pinheiro is directing attorney at the Esperanza Immigrant Rights Project, a Los Angeles-based organization that made available many of the child complainants who were interviewed for this story. There are also complaints of verbal abuse, of agents calling the children and teenagers "parasites," "dogs," "whores" and worse, and threatening them with bodily harm. A legal services project by the American Bar Association in the Rio Grande Valley filed 74 complaints on behalf of child immigrants in 2013. "We understand that there are lots of children, and that the officers are under extreme pressure. There's not enough space; it's very stressful," says Michelle Quintero Millan, staff attorney with ProBAR. "But at the same time, treating kids in this way ... it's inappropriate, regardless of the humanitarian disaster that's going on right now." CBP Commissioner Kerlikowske said he has read a synopsis of the most recent complaints filed by the five groups last month. "What I did not see," he said, "other than several complaints of offensive language, I didn't see complaints of assault or use of force." But there were complaints of physical abuse. A 17-year-old Guatemalan named Jose Miguel says agents repeatedly kicked him and his cellmates awake at night to conduct the count. "Maybe they can't handle so many kids," he says. "They're fed up. They're angry because they can send the adults back, but they have to attend to the children." Shawn Moran, vice president of the National Border Patrol Council, the agents' union, was asked if some of his members might be taking out their frustrations on the child detainees. "I don't think there's any overt attempt to try and make this more difficult than it has to be," Moran said, "especially for juveniles. Because in the end we are responsible for the well-being of people in our custody." 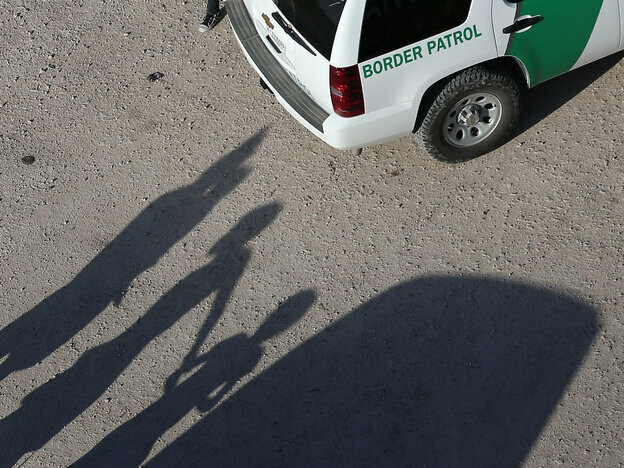 Immigrant attorneys characterize the alleged mistreatment by the Border Patrol as "systemic," but it's unclear how widespread it is. A dozen immigrant mothers and children were interviewed who had nothing to do with the formal complaints. All of them agreed the cells were cramped and cold, and the bologna sandwiches were terrible, but they said they were well-treated. "The treatment we received was good, up to a certain point, because Americans are excellent human beings," said Osiris Sandoval, a 26-year-old mother from Honduras who was sitting at the McAllen, Texas, bus station after being released from Border Patrol custody. Customs and Border Protection knows it has an accountability problem. Immigrant rights groups have filed these types of abuse complaints for years to the Department of Homeland Security's Office of Inspector General and the Office for Civil Rights and Civil Liberties. The lawyers say the grievances usually never go anywhere; CBP investigators have reportedly responded to the recent complaints by interviewing about a dozen of the children on the telephone. Last month, the agency removed its head of internal affairs, James Tomsheck, amid accusations that he ignored misconduct by CBP officers, who comprise the nation's largest police force. Stephen Kinzer, after Jack Woddis in An Introduction to Neo-colonialism (1967), and David Halberstam, is a major expert on American neocolonialism in his The Brothers: John Foster Dulles, Allen Dulles, And Their Secret World War (2013). Kinzer writes that John Foster Dulles and Allen Dulles guided their country through the world during an era of extremes. The passages of time, and the end of the Cold War, make it difficult to grasp the depth of fear that gripped many Americans during the 1950s. Foster and Allen were chief promoters of that fear. They did as much as anyone to shape America’s confrontation with the Soviet Union. Their actions helped set off some of the world’s most profound long-term crisis. Foster and Allen took a ruthlessly confrontational view of the world. They saw it as a theater of conflict between two mighty empires, one of which must ultimately vanquished the other. This paradigm began gaining currency in the years after World War II. By the time Foster and Allen rose to power, it was close to a national consensus. There had been no similar rush toward global engagement after World War I. Many Americans were content to return to life at peace and allow other countries to shape their own destinies. For a brief period after World War II, it seemed the same might happen. Senator Robert Taft ran for the Republican presidential nomination in 1952 urging a foreign policy closer to isolationism than imperialism. His defeat marked the end of serious dissent from the spreading consensus. Foster and Allen’s brand of liberal internationalism, aggressive engagement, and corporate globalism emerged triumphant. Soon after they became secretary of state and director of central intelligence, Foster and Allen failed their first conceptual test. Stalin died in Moscow on March 5, 1953, and in the months and years that followed, his successors made periodic overtures to the West. Foster and Allen categorically rejected them. They considered each Soviet call for “peaceful coexistence” a ruse designed to lull Americans into false sense of security. But failing to explore possibilities for a new superpower relationship in the period after Stalin’s death, the Dulles brothers may have sharpened and lengthened the Cold war. The next great failure of imagination was their inability to understand Third World nationalism. They were too quick to see Moscow’s hand behind cries for independence and social reform in Latin America, Asia, and Africa. These continents were to them little more than a vast Cold War battleground. They never sought to engage creatively with the aspirations of hundreds of millions of people who were emerging from colonialism and looking for their place in a tumultuous world. Instead they waged destructive campaigns against foreign “monsters” who never truly threatened the United States. Historians have recognized these two far-reaching lapses in judgment. A third has become clear with the passage of time. Foster and Allen never imagined that their intervention in foreign countries would have such devastating long term effects—that Vietnam would be plunged into a war costing more than one million lives, for example, or that Iran would fall to violently anti-American zealots, or that the Congo would descend into decades of horrific conflict. They had no notion of “blowback.” Their lack of foresight led them to pursue reckless adventures that, over the course of decades, palpably weakened American security. One reason Foster and Allen never re-examined their assumptions was that the two men so fully reinforced each other. Their worldviews and operational codes were identical. Deeply intimate since childhood, they turned the State Department and the CIA into a reverberating echo chamber for their shared certainties. Foster and Allen never imagined that their intervention in foreign countries would have such devastating long term effects—that Vietnam would be plunged into a war costing more than one million lives, for example, or that Iran would fall to violently anti-American zealots, or that the Congo would descend into decades of horrific conflict. They had no notion of “blowback.” Their lack of foresight led them to pursue reckless adventures that, over the course of decades, palpably weakened American security.